Hello! Since a bunch of you asked to hear more about my trip to India, I decided to do a blog posting about it today! Hopefully I will answer all of your questions, if not, just let me know. Also, if you came to this blog to learn about low calorie food, you may want to skip this posting since it isn't very relevant. So, I went to Bangalore on business a couple of weeks ago. I'm a product manager at a high-tech company in the Silicon Valley, and one of my engineering teams works from Bangalore. Now to be clear, I only visited one city India (so my experience was somewhat limited). But, it was really fun and very eye-opening, and definitely makes me want to go back to see more (in particular the Taj Mahal)! I think one of you asked if I got to fly in business class, and the answer is yes, on Lufthansa. The flight out to India is *very* long. Since it is halfway around the world from California, you can actually go in either direction, flying through the Pacific to Singapore or flying through the Atlantic through Frankfurt. I flew through Frankfurt. The first flight was about 11 or 12 hours. I had a quick layover (I can barely remember it), and then I took another 9 or 10 hour flight to Bangalore. I arrived at 1:00 in the morning which was a bit scary for me since I was alone (I had dreaded this part). Since the traffic in India is so horrendous (my picture here does not do it justice since it was from the weekend), you actually need someone to drive you around. So, I had a driver and car assigned to me for the week. We sat in hours and hours of traffic together, just trying to go a few miles here or a few miles there. Since Bangalore is a developing city, the city has grown faster than the infrastructure. So, things are extremely chaotic with cars, motorcycles, rickshaws (see pic), sometimes animals lining the streets with no traffic rules, signals, or laws. Very different! Okay, onto the food! My camera battery ran out so I don't have a lot of pictures of food. A coworker took the picture I posted at the beginning of the blog, which actually is of my most favorite meal. All of that food shown in the picture was vegetarian and it was all for me!! It was like a mini-Indian buffet made for one. And it was *so* good! 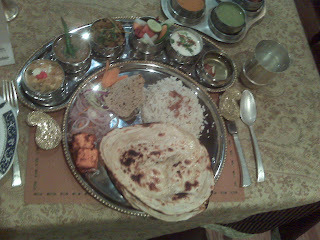 I think I ate Indian food at least once or twice every day, which I loved (and miss)! What made it better in India was the variety. I liked dishes like the one above since they let you try so many things versus having to pick one or two off the menu. I didn't worry about calories at all which was really fun (and I didn't gain any weight which was even better)! This picture is of one of the government buildings in India and also should give you yet another idea of what the city looked like. I have to say, all of the people there are incredibly friendly and nice and I felt very comfortable by the end of my trip. I brought back some great stuff -- little hand carved wooden elephants, many pashmina scarves and shawls, some really gorgeous Indian style placemats, a $10 silk tie for my husband, as well as some beautiful Indian dishes and paintings. I had a ton of fun! I would've been scared if I was by myself, too!! You and your driver were probably best friends by the end of your trip. That traffic looks insane! I like those little yellow cars. It seems like it's just crazy and chaotic. The food looks great, though! I never worry about calories- ever haha I used to be a calorie counter, but it's just too much work. eeekk! thanks for sharing with us your experience in India. I've heard that the traffic and pollution in India is terrible. Glad that you had a good drive to take care of you. look at that food pictures - looks great! thanks for sharing!